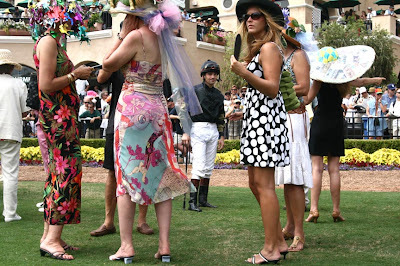 For a fleeting moment, the group of large-hatted ladies parted to reveal a jockey waiting for his horse. The gap closed seconds later, and I was kicking myself for not getting the tops of the ladies' hats in the photo. Had I had a wide angle lens on... alas! 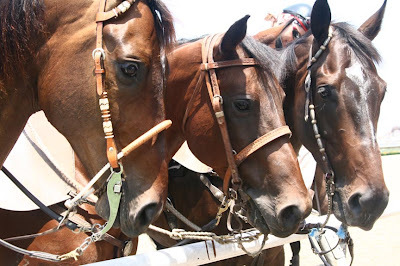 But, this is still one of my favorite photos from the first day of the Del Mar races, 2008. It was luxurious, sporting a media pass. There was a gated off area right next to the track, so I waved at a security guard and smiled sweetly while he pondered my plastic media ID card and he finally decided it would be OK to let me in. So I got to stand right against the railing, with my toes in the track dirt. Right next to where the horse handlers brought out the race horses, and hung out before doing their warm up jogs. The security guard presented some carrots to a few horses, and they all jostled to receive one. Here they are looking hopeful for more carrots. And I've not even posted about the amazing hats that turned up for the hat contest! That warrants a whole different post. Stay tuned.